If you looking to have a car restored, made into a resto-rod or a custom car built from scratch SAR should be high on your consideration list. I have been an avid hot rodder for over 50 years and have built my share of rods and customs during this time. These were mostly original cars hot rodded to some degree with changes to the drive line, custom wheels/tires, nice paint job and maybe some flames or pin striping. Something that the average hot rodder could do in his garage with a box full of tools a jack/stands and a lot of elbow grease, sweat and occasional cussin’. If you’re any kind of a hot rodder, well you’ve been there I’m sure. Shortly after my retirement 10 years ago I decided to build a car that was something more than what I was capable of with my limited talent and time. I had formulated many ideas in my mind over the years but knew instinctively that to pull it off I was going to have to find an extraordinary shop that could make my ideas and dreams a reality. And so the search began, first in and around the Phoenix area where I lived and then widening the search to California and Nevada. I used my extensive stash of rod magazines to formulate a list of shops that were capable of building a car at this level and then I made a short list of capabilities including exceptional metal working fabrication, top notch mechanical skills, outstanding paint and interior work and fit/finish second to none. And, it should all be done in house as a turn-key project. None of this ‘subbing’ out for this, that and the other thing. Finally, the most important thing I needed was help in turning all of these ideas running around in my head into a cohesive design. If there’s one thing I’ve learned building hot rods over the years, get your ideas down on paper before you start cuttin’ things up. With my search underway I quickly eliminated local Phoenix area shops and begin focusing first on the So Cal area, considered to be the birth place of hot rodding, followed by central and then northern California. It became obvious after visiting a number of these shops that this was going to be a more difficult task than I thought. After reading about all these shops in rod magazines over the years I figured it would be a ‘no brainer’. Turns out none of these shops met the criteria I had outlined and in fact most if not all ‘subbed’ out one or more aspect of their work even though they touted their ‘turn-key’ capability. At this point I was getting discouraged if not disillusioned. It just so happened that a co-worker and close friend living in Oregon had his ’55 Chevy 210 done at a local Portland shop and I was dully impressed with the workmanship. He suggested that I consider the shop for my project but I had resisted up to this point because of the location and not being able to be that involved in the build process. To satisfy my own curiosity I decided to do a ‘drive-by’ during a trip to the Northwest with my wife. After dropping my wife off at a local antique show I drove over to the east side of Portland to check out Steve’s Auto Restorations. Honestly my research led me to believe that they mostly focused on high end classic restorations vs building hot rods and customs. Boy was I mistaken. When I wandered into the shop they had a ’55 Nomad body on a surface plate that had been sliced and diced every which way and it just about blew me away. This is the stuff you only read about and see in magazines. I was amazed. This car would eventually become the Foose designed RealMad custom. It was definitely one of the leading-edge cars created in the 90s. After touring SARs facility it didn’t take me long to conclude that this was the right shop for my project, which coincidently was also a ’55 Nomad. I had to wait several months for them to finish RealMad before they could begin my project. During this time we were able to finalize design ideas and much of the project details. 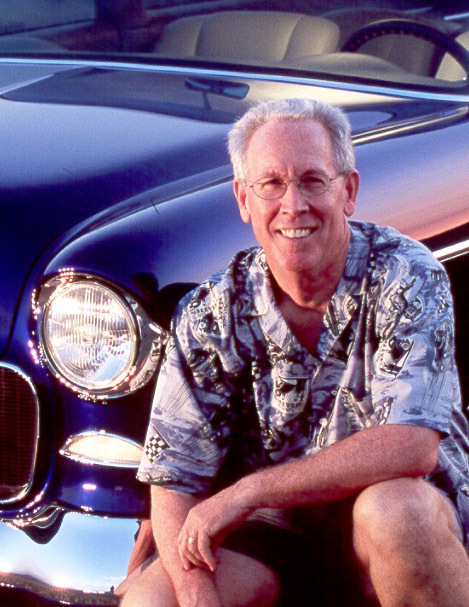 The 18 months that it took to build the car was one of the most rewarding times in my ‘hot rodding’ life. SAR took my Nomad to levels previously not seen in the industry. From the scratch built chassis with air-ride adapted Corvette suspension to the thousands of custom body modifications and hand formed glasses and chrome trim NewMad would set the bench mark for custom cars for many years to come. None of this would have been possible without the extraordinary group of people at Steve’s Auto Restorations. SAR is one of the premier hot rod shops in the nation that I am humbly honored to recommend to anyone. If you don’t believe me, stop by and see for your self.